From Turkey to Egypt, Bulgaria to Ukraine, and Brazil to India, we witness the rise of an angry urban middle class protesting against what they see as fundamental corruption of their political regimes, perceived as predatory and inefficient. Corruption is near the top of all global protesters’ list of grievances – from the Occupy movement to the Arab Spring. Their countries have benefited to varying degrees from globalization, but their regimes have all failed to evolve politically to meet their expectations. Corruption has become the main explanation for failures in government performance, for networks of patrons and clients subverting fair competition, and for billions of Euro in disappearing public funds, national or foreign assistance income. The economic crisis exposed the hypocrisy of rich countrieswhich control corruption at home but use it to advance their economic interests abroad. The rise in the last two decades of an international anti-corruption regime only raised awareness but failed so far to diminish corruption. There is increasing demand for good governance resulting in quality education and health systems, and denunciation of sheer bread and circus populism. Briefly put, governments unable to control corruption cannot get away with organizing football World Cups anymore. 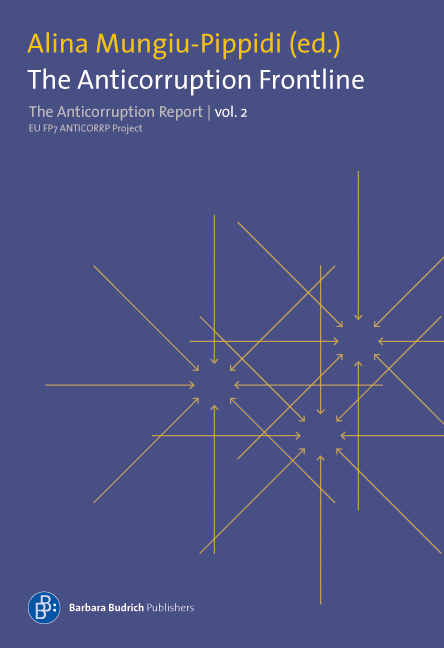 Volume 2 of the Anticorruption Report tackles these issues across key cases and developments. Korruption sei der häufigste Anlass für Proteste – weltweit: Von der Occupy?Bewegung bis zum Arabischen Frühling, immer sei es ein Versagen der politischen Elite, das junge Menschen auf die Straße treibe. Für dieses Versagen seien häufig Vetternwirtschaft, Bestechung und die Veruntreuung öffentlicher Gelder die Ursachen. So lauten einige der Ergebnisse des EU?Forschungsprogramms Anticorrp (Anticorruption Policies Revisited: Global Trends and European Responses to the Challenge of Corruption). Bei diesem Sammelband handelt es sich um die Fortsetzung des ersten Antikorruptionberichts. In Fallstudien aus der Ukraine, Bulgarien, Ruanda und Katar werden die Entwicklung der Korruption und ihre Bekämpfung nachgezeichnet.